Wouldn’t it be wonderful to have a taste of all of life’s best offerings? Living in Sera of London’s Little Venice apartment that’s sprinkled with a bit of everything is the closest you can get! 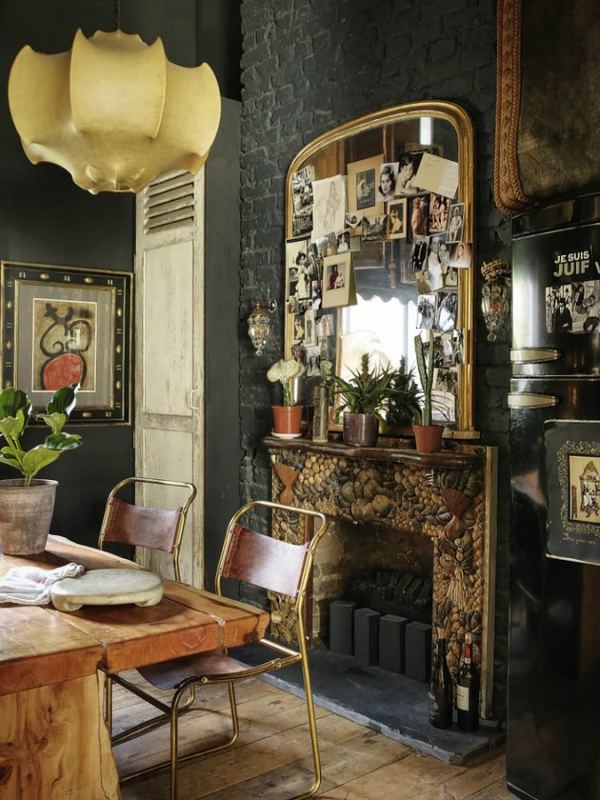 The lovely place has a hint of Bohemian, European, Miss Havisham, which altogether create something totally different. Still, the past is kept preserved which makes it even more beautiful. While minimal style has become the ideal interior design with the vastness of white walls and bursts of colors, there are homes that can fascinatingly keep decor after decor and layer upon layer of texture, plus a wide array of colors without tending to overwhelm nor look too cluttered. New things may be shiny and eye-catchy, but old things remain to keep their own distinctive beauty and has a certain presence that’s one thing to love about European architecture. 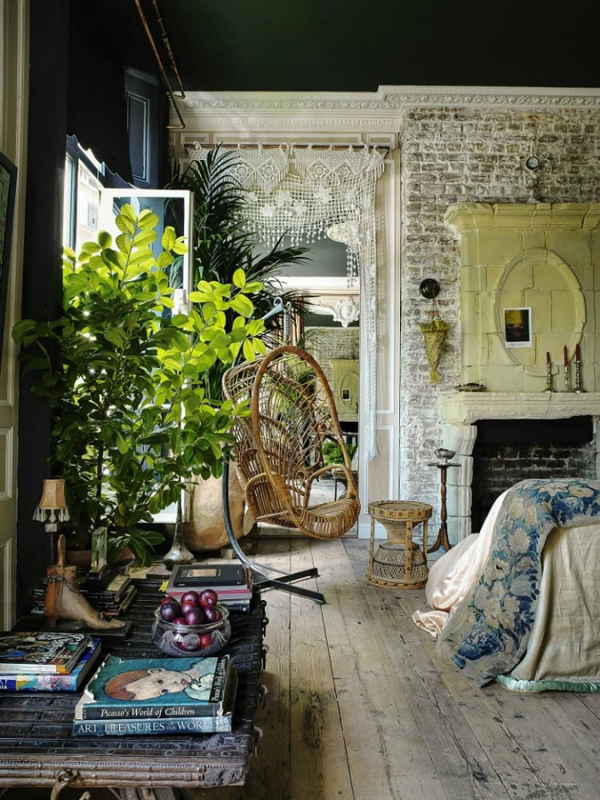 Combined with the unconventional and artistic Bohemian style, wooden earthy tones and nature’s elements in various plant life, the home becomes an instantly brighter place. Antique pieces, wicker and lace, old wooden flooring, ornate fireplace mantels, brick walls, and decorative mouldings produce an unparalleled atmosphere in this home. A dark palette rules the kitchen with predominant black walls, wall accent, refrigerator, and dark brown furniture. A large mirror with a gold frame is lined with photographs old and new. 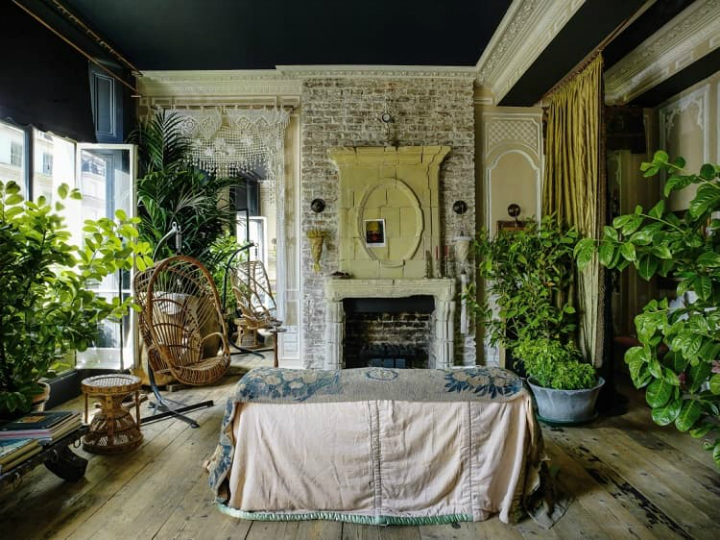 Plants arriving in different sizes and shapes contained in small pots grace the seashell-covered fireplace. 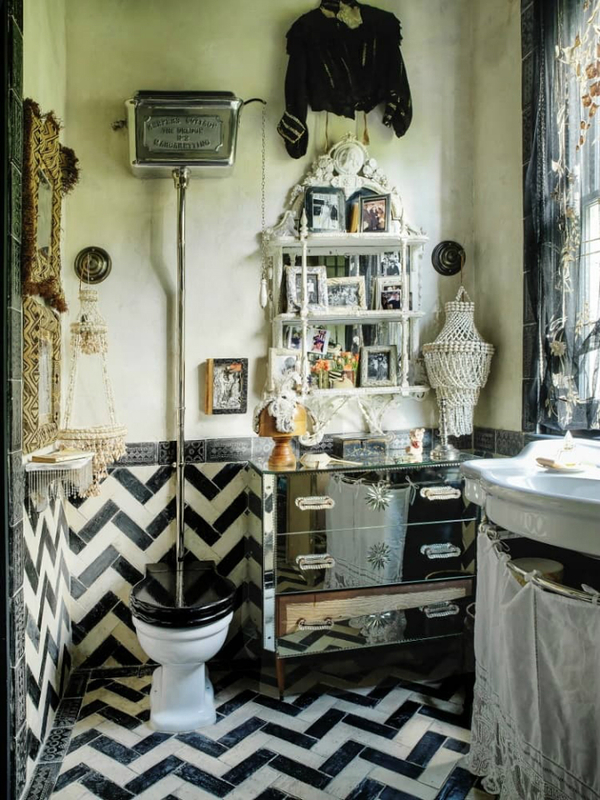 The bathroom will take you to a trip to the past with the gorgeous vintage chevron pattern tiles, a luxurious mirrored dresser, elegantly carved shelves, intricately textured wall hangings, drapes and all other accessories. A number of small frames with black and white and colored photos are set atop the shelves. Dark colors and hues extend to the bedroom. 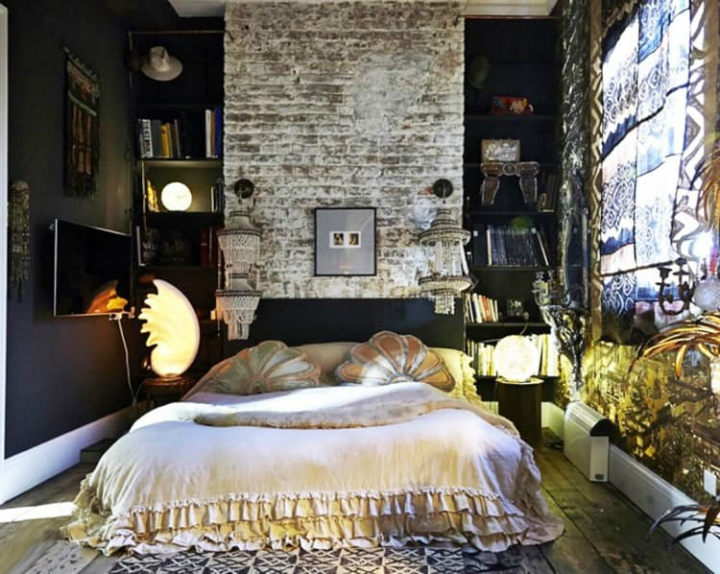 A large bookshelf lines either side of the headboard with a brick wall at the center. A couple of round lamps and shell-shaped lighting that matches the seashell pillows give ample illumination. Timeless pieces and similarly intricate textures and decorative accents are present, as with the whole apartment. A wall-mounted TV is one concession to provide the comforts of modern day living. That’s the good thing about an eclectic interior, for the objects you choose can be from traditional to modern, and bought at different times each with their own history and beauty. Every item is unique with contrasting appearances yet complements the rest. Altogether, coming up with your own collection that suits your budget can create the loveliest home that’s simply perfect.